Here’s a groovy – if slightly later than we’re used to – version of one of my favorite songs. I have whipped Bob Seger and the Last Heard’s epic ‘East Side Story’ on you in various and sundry ways (ILRS, mixes, single tracks, covers) over the years. Last year, whilst occupied rooting around on the web, I happened upon the record you see before you on a sales list, confirmed that it was the same song and purchased it forthwith. When the disc fell through the mailslot and I had a chance to spin it all the way through, I was a happy camper indeed. What you get here is all of the power of the OG – minus some fuzz – played in a 1982, new wavey (sorta) stylee by a Detroit-area group called the Finnz. 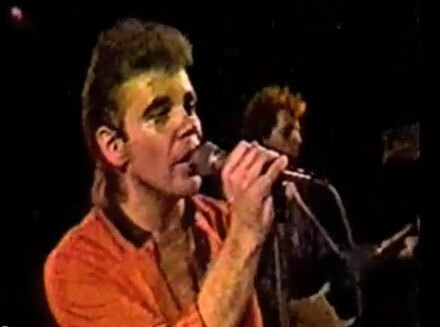 Led by singer Dennis Quinn, the Finnz released a pair of 45s in 1982, and even (fortunately for us) made an appearance playing this very song on Detroit TV. 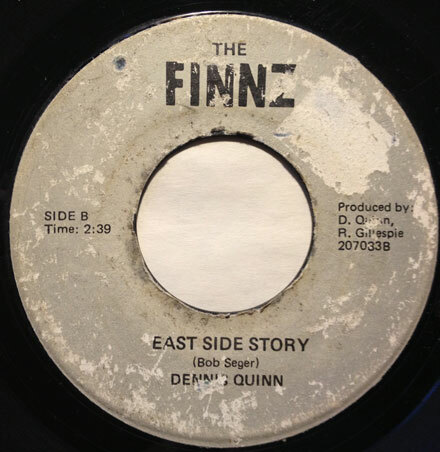 The original East Side Story was a major regional hit, and it’s not hard to imagine why a Motor City band might want to bring it up to date with their own version. Guitarist Robert Gillespie had played in a post-MC5 group with Rob Tyner (calling themselves the New MC5!? ), and after the dissolution of the Finnz went on to a long association with none other than Mitch Ryder. This is a very cool 45, and joins the list of fantastic covers of ‘East Side Story’ alongside the St Louis Union, Caretakers and others. Recycling Never Sounded So Groovy! One of the great pleasures of record collecting/researching is that every once in a while you come upon something genuinely surprising and groovy. If you follow the Iron Leg Radio Show Podcast, you will have already heard the Round Robin instro ‘Sit and Dance’ a few episodes back. It is a very swinging bit of Hollywood-au-go-go with some very ginchy organ in the middle and has the sound of a prime, mid-60s, swinging nightclub/discotheque scene. I had every intention of giving the song its own write-up when something very strange happened. I had been wanting to get my hands on the very cool, pre-Monkees Micky Dolenz 45 ‘Don’t Do It’ (which I will post sometime soon) and was lucky enough to grab a cheap copy a few weeks back. There was a gap of a few days between when it fell through the mail slot, and when I had an opportunity to digimatize it. I had never heard the flip-side, ‘Plastic Symphony III’ before, so when I dropped the needle into the grooves I had my mind blown, because there, coursing from the speakers was the very same track as on the Round Robin 45. Naturally, I leapt upon the interwebs in search of information, and while I can’t say I have any definitive answers for you, there are several intriguing clues to be had. 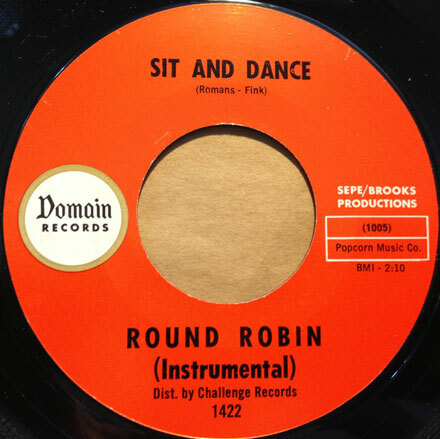 The Round Robin 45 appeared on the Domain label, which was distributed by the Challenge label, on which the Dolenz 45 was released. Both records were produced by Tony Sepe and Martin Brooks, co-owners of the labels with Bob Krasnow. Where the song appears as ‘Sit and Dance’ the writing is credited to Elaine Fink and Shirley Romans. 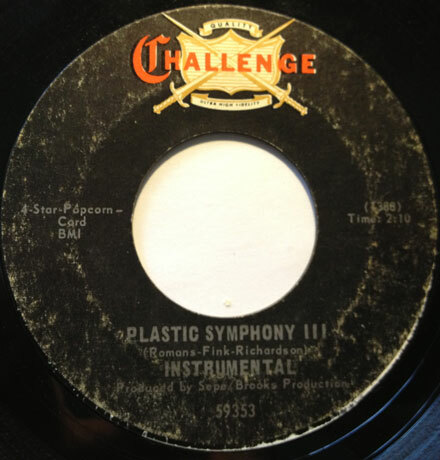 When the song appeared as ‘Plastic Symphony III’ on the flipside of the Dolenz 45 (credited only to ‘Instrumental’) the name Bob Richardson was tacked on. Fink and Romans were also credited with composing another Round Robin instrumental b-side, ‘Slauson Shuffletime’. Other than than, I find myself in Dead-eds-ville. While I find nothing shocking about the re-use of the track – that kind of thing happened all the time, especially when throw-away tunes were slapped on the flipside of a record so as not to distract from the featured track (Sit and Dance appeared on the flip of more than one Round Robin disc) – I think that ‘Sit and Dance’/’Plastic Symphony III’ is especially cool. Though I don’t have much to go on, I wonder if Fink and Romans were actual songwriters, or merely names of friends or family members slapped on a tune to collect royalties. This month we have lots of groovy new arrivals in the crates, some of that groovy East LA stuff and a closing set with some moog/easy action as well. Pay special attention to the demented square/brain melt of the Avant Garde, and the gospel meets the Avalon Ballroom ish of Clover, as well as the PNW garage folk of the Daily Flash, a long-time want list item satified. All in all you get to stuff your ears with an hour and forty minutes worth of quality sounds, all jumping off of the wax and changing magically into the ones and zeros of your dreams. ORIGINALLY POSTED AUGUST 2008 – NOTE: I’ve been away this weekend at a family reunion and didn’t have time to get a new post ready. This is one of my favorite mixes in the Iron Leg Digital Trip Archive. I hope you dig it too, and I’ll see you all next week with a new episode of the Iron Leg Radio Show. I hope all is well on your end and that everyone had a relaxing Labor Day weekend. The mix I bring you today in the guise of Iron Leg Digital Trip #16 is one that has – how do they say? – been percolating in my fevered brain for nigh on 20 years. The 45 I picked up a few years later was ‘Feelin’ Lost’ on Cameo. The first time I dropped the needle on the wax my hair pretty much stood on end as visions of ‘Help’ outtakes danced in my head. ‘This song’ I thought ‘is as Beatle-y as anything I’ve ever heard by a band that was not themselves the Beatles!’ And it was. The track that closes the mix is the aforementioned ‘Don’t Be Ashamed’ by the Legends, which has the British Beat sound, a repeated ‘She Loves You’-esque rhythm guitar riff and an ending that is an outright bit of thievery (though they’d probably call it an homage). I hope you dig the sounds, and I’ll be back next week with some more cool stuff.